A circular walk around the perimeter of the old city in York following the remains of the original city walls. The walk can be started anywhere along the route and broken off at any point to explore the city's many fine teas shops for a break! 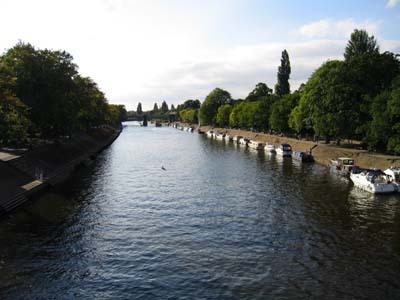 Parking: There are numerous pay and display car parks in the centre of York. One handy for the start of the walk described is the one on Nunnery Lane (grid reference SE 599 513). Map: The city walls walk is well signed around the city. There is a map available for a small charge from tourist information centres in York - entitled 'York Walls Wall Map'. Whilst the City of York is famous for its Minster, the Yorvik Viking Centre and the excellent shopping areas such as the Shambles, around the perimeter of the old city are the remains of the original city walls. Whilst they are no longer fully complete, the remains form a very enjoyable basis for an afternoon stroll to take in much of the city's history before exploring the city's many fine tea shops. The walk itself, as it is a circular, can be started from any point on the wall. The description starts at the Micklegate Bar through which the A64 to Leeds / London passes. Looking at Micklegate from outside the city walls, go up the steps on the left hand side and to arrive on the walls path. The path is very consistent all the way around the city - where it exists it is flat concrete / stone in construction and easy to walk on. Care must be taken at points as there are drops on the inside of the wall, often unfenced and sometimes up to 20 feet in height. In the 14th century, this was a Royal gateway where heads of traitors were displayed. Follow the path around past the railway station and head around towards Lendal Bridge. To the inside of the walls are the remains of the old railway station. The path leaves the wall just short of Lendal Bridge. Walk across the bridge and continue up Museum Street with York Minster up ahead in the distance. Shortly after the bridge, turn left between Lendal Water Tower and St Leonard's Hospital. A few yards further, the path turns right around Multangular Tower and passes the Anglian Tower before arriving at the Tourist Information Centre at Bootham Bar. On the inside of the city walls, High Petergate passes underneath Bootham Bar before becoming the A19 to Thirsk on the outskirts of the wall. Climb the steps by the Tourist Information Centre to pass back up onto the city walls after passing through Bootham Bar itself. The wall now begins to circle around the Minster passing the Minster library, the deanery and the Treasurer's House before arriving at Monk Bar, where the Richard III museum is located. Through Monk Bar, the path continues past the Ice House, Merchant Taylor's Hall and St Cuthbert's Church before dropping down again onto the road. On the opposite side of the road here slightly to the right is The Black Swan, which is a 16th century Inn. Cross over the road at the junction and follow the pavement over and around to the far side of the River Foss. Walk down the pavement now by the side of the Foss for just under a quarter of a mile where the Foss bends away from the pavement. Just past this on the right is Red Tower built in 1490. The tower marks the termination of the City Wall and at one time marked the commencement of an impassable swamp, which extended to Layerthorpe Postern. Formerly the tower was known as Brimstone House after what was carried on within its walls. Walk around the back of the Red Tower and again go up the few steps back onto the wall's path. From here continue for a further quarter of a mile around to Walmgate Bar, which is a 12th century archway and the only remaining Barbican in Britain. Continue along the wall at the far side of the Bar along to Fishergate Bar, which was bricked up after a riot in 1489 and re-opened in 1827. Just past Fishergate Bar the wall swings around to the right to Fishergate Postern Tower at which point the road is rejoined. Continue ahead along Fishergate and pass over the River Foss once again. At the junction with Tower Street, turn right for just over one hundred yards to visit Clifford's Tower and York Castle Museum. Then return back down Tower Street to the monument in the roundabout and this time turn right to pass over the river Ouse via Skeldergate Bridge. On the far side of the bridge, climb the steps to once again join the city wall path. Over to the right where the path is joined is Baile Hill - the site of a wooden castle.